Red Letter day! And not just because my friends at Icon Estates, gifted me with two super fun Cabernet's. I am getting a refund! But the drama? What I really need at tax time is a drink. Maybe two. 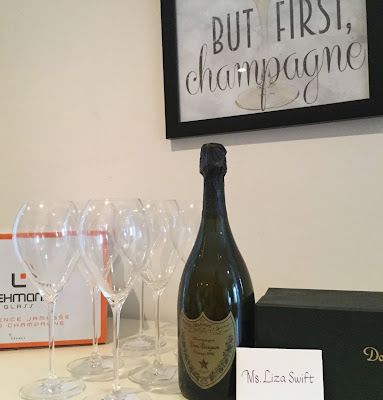 Or 10. Whatever. What I would do without TurboTax is beyond me. I haven't busted out a calculator since the early 90's. 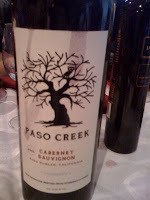 Which incidentally is the score racked up by the scrappy folks at Paso Creek for their '06 Paso Creek, Cabernet Sauvignon, Paso Robles. The way they describe it I didn't know whether to date it or drink it, " brawny and ripe, full-bodied, juicy, and intense" Add brooding and out of work and I would be all in. But I digress. It's wine. So I drank it. I liked the intensity of the color. Dark and inky. The aroma was inviting. With cherry, berry, spice and vanilla, the scent belied a tasty classic Cab. With grippy tannins and taste of cocoa on my tongue from the wine, I reached for a handful of dark chocolate from the dessert table and was pleasantly surprised. The chocolate went very well bringing up the brambly taste and smoothing out the assertive tannins. I love a grippy Cab! Next up was one of my favorite things in the world: a Napa Cab. 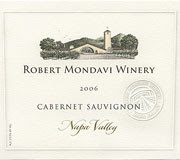 '06 Robert Mondavi Winery, Cabernet Sauvignon, Napa Valley. After the good experience with the Paso Creek, I geared up for another taste treat. I was not disappointed. Out of the bottle, the wine was fragrant with dark berry, subtle spice and a lovely vanilla-cherry. In the mouth is had a smooth food friendly character that I described with an intensely technical scrawl. One word. Delicious. Slight tinge of cedar and lovely flavors of cherry, berry and pepper. It went well with the herbaceous and perfectly roasted chicken and vegetable platter it drew as a food match. This wine was smooth enough to pair well with a lot of food I would imagine. At $28, it seemed like an excellent value for a Cab from Napa from a name you would recognize. The winemaker's notes call out the blend : 80% Cabernet Sauvignon, 12% Merlot, 3% Cabernet Franc, 3% Malbec, 1% Petit Verdot and 1% Syrah. A skilled hand balanced all those elements together into a cohesive whole that left me in the black. Black berry deliciousness and a wine I am sure to tap again. After all, I'm getting a refund. Whee!